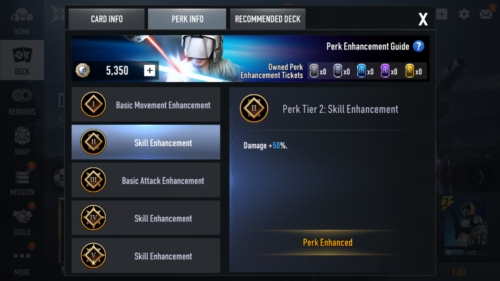 Here is a basic guide to working on perking up your Force Arena heroes. This isn’t the only way, but this is the way I recommend is to systematically upgrade my perks until I had my main dark side hero fully perked out. Now you might as well prepare to start saving a lot of credits to complete this process. With the update of 3.0, FTP (Free To Play) players will face a huge in game credit crunch. As a result we recommend that you focus on a single faction or hero if you are FTP. If you are PTP have fun with it all – you have a huge advantage here. Every Hero’s perk ability boosts are different and usually enhance a couple of different aspects of the Hero. In the case of Dengar it enhanced his run speed, skill damage, basic attack range, and reduced his skill cooldown. Perks can be acquired a couple of different ways, for new players this is most likely going to be the more difficult part. The first way is to destroy cards you hold in excess in your decks. 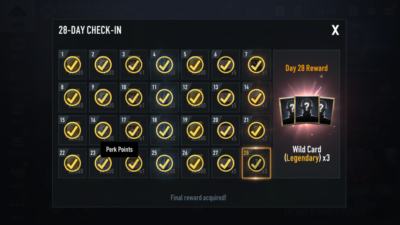 The other option is to acquire perks through the various 28 log in rewards menu. Perks can be acquired from the 28 day login on the 2nd, 9th, 16th and 23rd day of the login.